Cow tongues are combined with electronic devices, such as electronic motors, motor controllers, and microcontrollers, which create the disembodied organs’ new functions and mechanical movements. A pig stomach was combined with a cam mechanical device, which was displayed with the Robotic Cow Tongues. 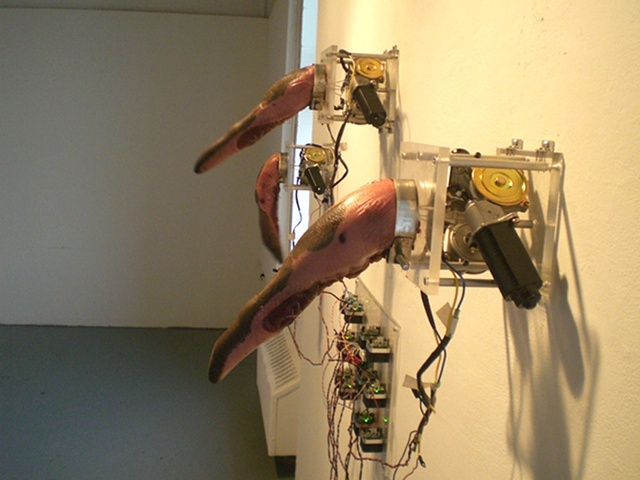 These works were the first project of the Organ-machine Hybrids project series to explore the notions of the artificial hybrid as a form of art, which promote the Organ-machine Hybrids projects’ purpose, repositioning and re-contextualizing of discarded biological materials for emerging new forms of art. Combining organs and machines in the early works brought forth technical and conceptual ideas surrounding further development of artificial organ and machine hybrids. The concepts of these ideal sculptural artworks using animal organs point out that the definition of the natural human and animal body is a continuing fluctuating meaning with technological augmentations in the current scientific society. The re-contextualizing of animal organs into artwork questions the human and animal body’s new contexts. Applying discarded biological material, such as parts of dead animals, in my artwork was not only influenced by the ongoing scientific issues of regenerating and redesigning the human and animal organism with prosthetic devices, but was also partially inspired by Nam June Paik’s first solo exhibition, Exposition of Music - Electronic Television, Wuppertal, Germany, 1963, in which he hung an ox’s bleeding head on a gateway of the gallery. The movements of the robotic tongues mimic jeering tongues, which cynically marks the current tendency of shock artists to senselessly abuse and kill live animals within artwork, without significant aesthetic viewpoints. The robotic jeering tongues not only represent the modernist’s provocative activities towards traditional art, such as anti-art movement, anti-high culture, and anti-market-driven art, but also represent the contemporary artists’ pursuit of profits and fame. This concept also points out that the definition of art continually fluctuates with its relationship to commercialism. The related work Indigestion: kinetic Pig Stomach with a churning machine inside shows how a public cannot digest extreme immorality with commercialism in art.